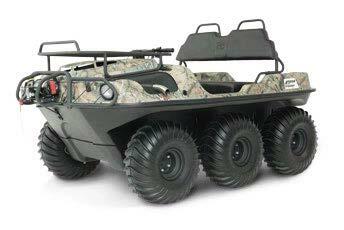 The smallest in Argo’s Wilderness series, this XTV comes with everything you need for hunting and angling trips. Standard equipment includes a front cargo rack, brushguard and a 3,500 lb. Warn winch. This model can carry up to 560 lbs. and seats up to four people. This model is available in Mossy Oak’s Break-Up Country or Shadow Grass Blades camo patterns. RC60 roller chain drive to all 6 axles.